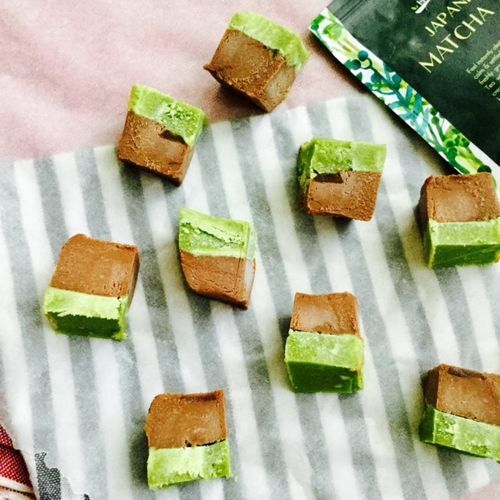 Who doesn't love fudge? For all the vegans out there, this is the fudge for you! It's also nut free and gluten free so pretty much everyone can enjoy this easy and quick sweet treat. In the midst of summer, no baking is needed and this is a perfect recipe to get the family involved as it's versatile and can even be made in cupcake moulds or any other silicone moulds you have to hand, you can get really creative with this recipe. 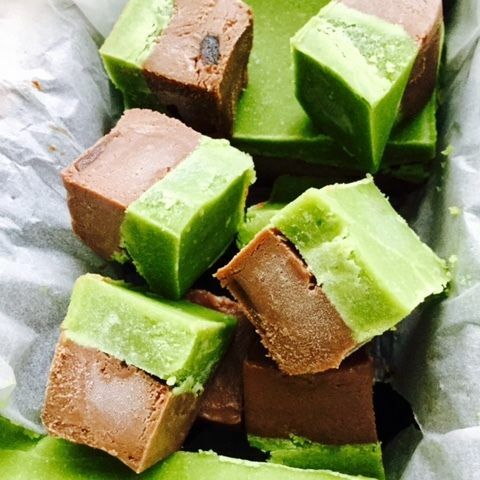 It can be made ahead of time and the matcha green tea powder helps to cut through the richness of the fudge whilst giving it that pretty green colour and adding antioxidants to your fudge. This is truly a new and healthy way to treat yourself so give this a go today! In a small saucepan over a very low heat, combine the chocolate mixture ingredients with a silicone spatula, stir constantly as the chocolate melts and it all comes together. Turn off the heat until you have a shiny smooth mixture; allow to cool completely before you pour into your lined (with greaseproof paper) loaf dish or brownie dish. If using, add your dark chocolate chips at this stage to get some nice texture in your fudge. 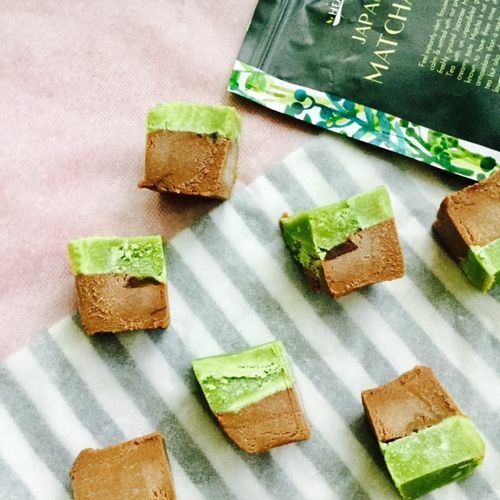 Pop in the freezer for about 20 minutes to firm up before you add your matcha fudge layer. In a small bowl, whisk together all the ingredients for the matcha layer at once and then spread it out gently onto your dark chocolate layer with a silicone spatula. Cover with an extra sheet of greaseproof paper and let it set in the freezer until it's completely solid, this will take about a couple of hours. 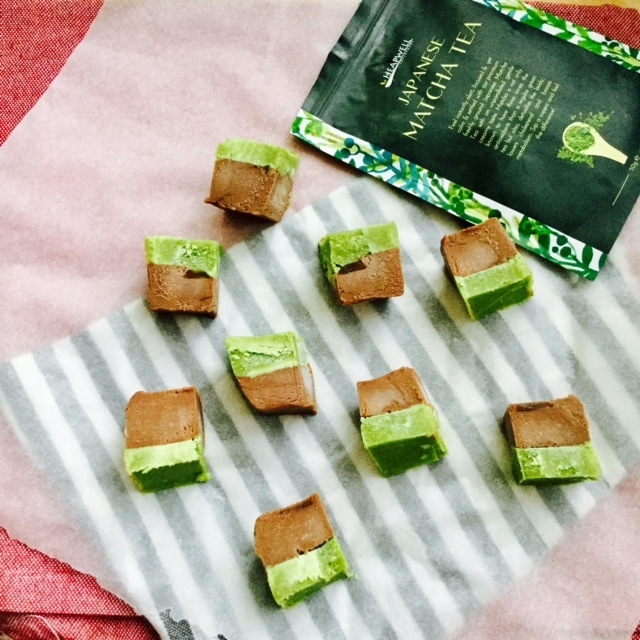 Cut into squares and enjoy right away! And there you have your easy peasy dark chocolate and matcha fudge, perfect to enjoy on a warm summers day or for a quick grab and go snack! 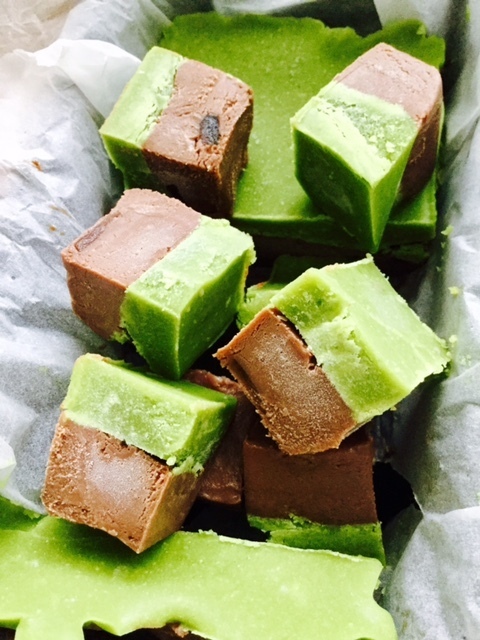 The fudge is best stored in the freezer and keeps for up to 3 months!